Siobhan Tu'akoi and Heimata Herman at the Cook Islands Health Conference in July 2016. Three young Cook Islands-focused researchers have been awarded scholarships in the latest New Zealand Health Research Council (HRC) funding round. The three University of Auckland students, Heimata Herman, Mayor Pokino and Siobhan Tu’akoi are associated with the NZAid-funded Pacific Science for Health Literacy Project (PSHLP) programme, a collaboration between the Cook Islands Ministry of Health, Cook Islands Ministry of Education and Liggins Institute at the University of Auckland. 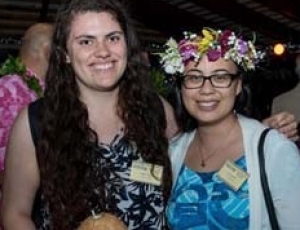 Siobhan Tu’akoi was awarded a three-year PhD scholarship to investigate non-communicable disease risk in Rarotongan adolescents and whether there is any association between non-communicable disease risk and their mother’s health while she was pregnant. Ms Tu’akoi will be working closely with the Ministry of Health and Rarotonga Hospital, and the data that she collects will help guide Ministry of Health decision-making in the future. Heimata Herman and Mayor Pokino were both awarded one-year Masters scholarships. Heimata will be investigating health-related behaviours in Rarotongan adolescents, while Mayor will be looking into attitude, knowledge, behaviour and health in Rarotongan adolescents. Heimata and Mayor were both born and raised in the Cook Islands, and then moved to New Zealand to further their education at the tertiary level. Heimata said that she considers herself “very fortunate to be able to do research among and for her own community and within an area that is incredibly important for the future health of the Cook Islands”. Both projects will work to identify the factors that encourage and discourage positive behaviour change in adolescents, with a particular focus on actions that support long-term health and wellbeing. Siobhan Tu’akoi and Heimata Herman are already at the Liggins Institute in Auckland, while Mayor Pokino is currently working as a Gender Statistician for the Statistics Office at the Cook Islands Ministry of Finance and Economic Management on Rarotonga. All three researchers will start their projects in March 2017 under guidance from locally based advisors from the Cook Islands Ministry of Health and the Liggins Institute (at the University of Auckland). Through the PSHLP project, a strong partnership exists between the Liggins Institute, and the Cook Islands’ Ministries of Health and Education. Over the last 3 years the partners have worked together to develop learning resources to support youth empowerment and decision making around non-communicable disease risk. The scholarships are a significant achievement for the Cook Islands’ Ministries of Health and Education, both organisations have contributed to the development and growth of these young emerging researchers. Jacquie Bay, the project leader of the PSHLP project said that “we are delighted to have found three students who are passionate about improving the health and wellbeing of Cook Island adolescents and Pacific youth within the region. And we are proud to be able to work with the Cook Islands’ Ministries of Health and Education to support and encourage the future health leaders and advisors in the Cook Islands”. See here for a link to a short article in the Cook Islands News after the New Zealand Health Research Council announcement was made.